I will be part of an exhibition at Blue Ginger Gallery, near Malvern, Herefordshire; The Peace Of Wild Things opening 19th March 2016. 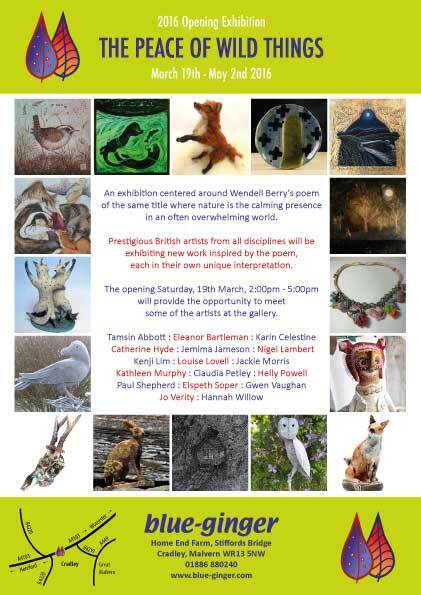 The exhibition is centred around the poem by Wendell Berry of the same title and will feature a number of fabulous artists from across the UK, working across ceramics, painting, glass, textile, jewlery, decoupage and metal. The opening is on Saturday the 19th of March and many of the artists will be there. All are welcome.